Left to Right - Cane Changer Project Coordinator Toneya McIntosh with Felicity Atkin, Vivien Dunn, Barb Ghidella and Belinda Billing at the women's field day. This article was originally published in the CANEGROWERS Australia Magazine on 24 September 2018. Women from across the Cairns sugarcane growing region gathered recently for the Cairns Women’s Field Day which focused on highlighting the important role of women in the industry and gave them the opportunity to find out more about local industry initiatives. Sarah Standen, CANEGROWERS Cairns Region Manager, was a driving force behind the day and said it was fantastic to see the women getting involved and wanting to find out more about what is happening in their local industry. The day kicked off with a tour of SRA’s Meringa Research Station, where the women heard from Principal Researcher (Water Quality) Belinda Billing. “Around half of the staff at SRA’s Meringa station are women and, while we certainly value the work we do with our local cane farming men, we are excited to share that work with the local women of Cairns cane farming community,” Ms Billing said. A highlight of the tour was the sugarcane variety breeding program. Senior Plant Breeder Felicity Atkin and Senior Technician Vivien Dunn took the women through the process of introducing a new variety into the industry, which takes 12 years, tens of thousands of seedlings and many, many hours of hard work. Barb Ghidella, one of the women attending the Field Day, was extremely impressed with the breeding program. “I’ve been around sugarcane all my life and I didn’t know half of what we learnt here today - it has been a really great day,” she said. The tour then headed to the Cairns Aquarium for a guided tour. Attendees were taken through their local waterways and explored how water travels off land through creeks and streams, before heading through the mangrove flats and out into the coral reef systems and the Great Barrier Reef. “Over the last decade, through programs like Smartcane BMP, our industry has been extremely focused on ensuring that we are doing the right thing by the environment and by the reef,” Ms Standen said. CANEGROWERS Cairns Region Chairman, Stephen Calcagno rounded off the day by providing the women with an industry update and inviting them to take advantage of the resources and support provided by the CANEGROWERS Cairns Region office. 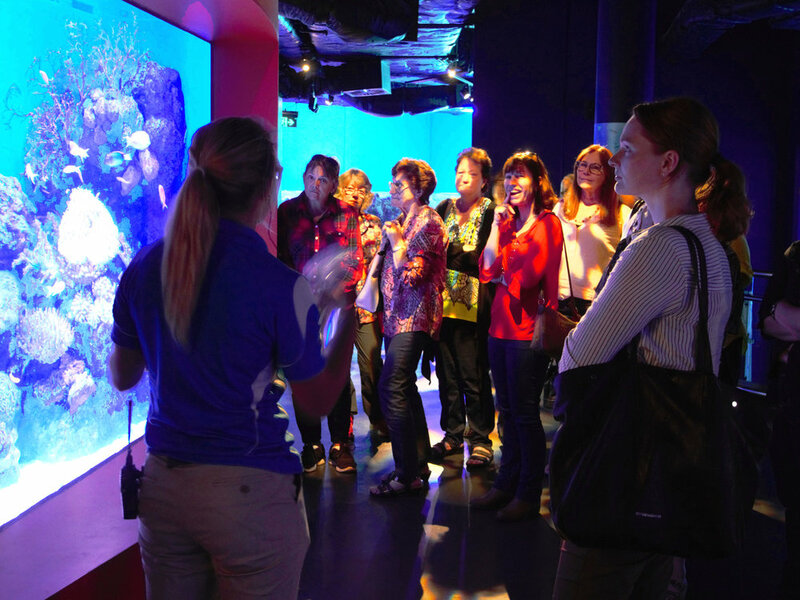 Attendees of the Women’s Field Day receiving a guided tour of the Cairns Aquarium to learn more about water quality and local ecosystems. The Women’s Field Day was supported by CANEGROWERS Cairns Region and Project Cane Changer. Cane Changer is a CANEGROWERS Organisation initiative, funded by the Department of Environment and Science, that is working with growers and their families to help improve recognition of the industry’s innovative history and pave the way for an even more sustainable future.